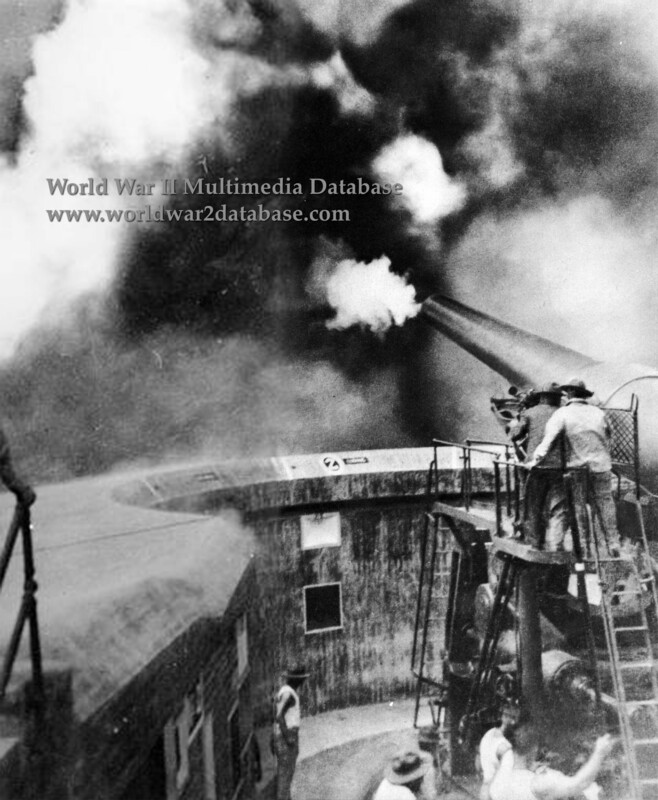 Gun Number 2 of Battery Crockett, Fort Mills, Corregidor, fires in a pre-war exercise. That view is often dated to the day of surrender. In this view, the gun crew isn't wearing helmets, and the intensity of shelling on the last day would preclude the gun crew standing in the open. Battery Crockett faced the open sea, so her guns did not engage the Japanese. Thus this photo could not have been taken on May 6, 1942. Crockett was manned by B Battery (60 men) of the 59th Coast Artillery Corps under Captain Herman H. Hauck (1915 - October 24, 1944). Battery Crockett was disabled by a 240mm (9.5 inch) Japanese shell fired from Cavite on April 24, 1942. Considerable damage was done to the guns and emplacement, and the plotting room, ammunition hoists room, and one gun were completely destroyed. Captain Lester I. Fox (August 12, 1912 - March 8, 1979), a 59th Coast Artillery surgeon, suffered a broken leg, fractured ribs, lost his arm below the elbow, and his right eye. Captain Fox crawled into Crockett's magazine and prevented an explosion. Private (later Sergeant) Cleveland Henriquez (March 15, 1915 - November 14, 1991) was severely injured in his spine and removed to Battery Morrison. Henriquez was driven by Navy truck under fire to the E Company Aid Station. According to Captain Aaron A. Abston (August 16, 1915 - June 5, 1992) Battery Crockett was hit again on May 3; the shell pierced the double wall of the powder magazine but the powder bags did explode. Gun Number 2 was serviceable at the time of surrender, but no targets presented in range. Hauck loaded the gun's recoil cylinder with a chain so that it would destruct if fired. Hauck and his men were detailed to Malinta Tunnel to serve as a reserve infantry force. Crossing under intense fire, Hauck and B Battery arrived at Malinta and were sent into action at 0615 Hours. Hauck led an aggressive assault that forced the Japanese back 300 yards, advancing to Kindley Field. It is not known when Hauck's men were told of the surrender. Hauck was killed in the sinking of the "hell ship" Arisan Maru en route to Japan in October 1944. Battery Crockett was built by Filipino convict and American contract labor during 1907-1911. Named for Second Lieutenant Allen T. Crockett, 21st U.S. Infantry who was killed in action at Candelaria, Philippines on September 4, 1901. Two 12-inch (305 mm) M1895 guns on M1901 Buffington-Crozier disappearing mounts had a range of 17,000 yards. Battery Crockett had a field of fire of 220 degrees with each gun able to traverse 170 degrees. After the surrender, American prisoners of war rebuilt gun number 2 with parts from gun number 1 but the Japanese did not put it in action in February 1945 when the island was invaded. Battery Crockett still exists and is a popular destination for Corregidor visitors.